Rotaract is the collegiate level of the world’s oldest and most renowned service organization, Rotary International, and serves as the intersection between service and professionalism for young adults ages 18-30. With 8,400 Rotaract clubs across 170 countries, Rotaracters engage in meaningful service initiatives worldwide and form an unparalleled network of influential, inspiring, and compassionate leaders. Clubs meet twice a month to exchange ideas for tackling global issues, plan activities and projects that impact communities of all sizes, and socialize and network with our fellow service members. Rotaract clubs are nonpolitical, nonreligious, and welcome any interested in making a positive impact on the world. UC Berkeley’s Rotaract chapter is one of the largest college based Rotaract clubs in the world, consisting of over 200 members devoted to putting “Service Above Self”. We were chartered in 2000, sponsored by Berkeley Rotary, and are one of the eight clubs in Rotaract District 5160. Cal Rotaract is also one of the largest ASUC-sponsored organizations on the Berkeley campus. On a weekly basis, club members come out to participate in activities that uphold Cal Rotaract’s 4 pillars: Service, Fellowship, Leadership, and Rotary. 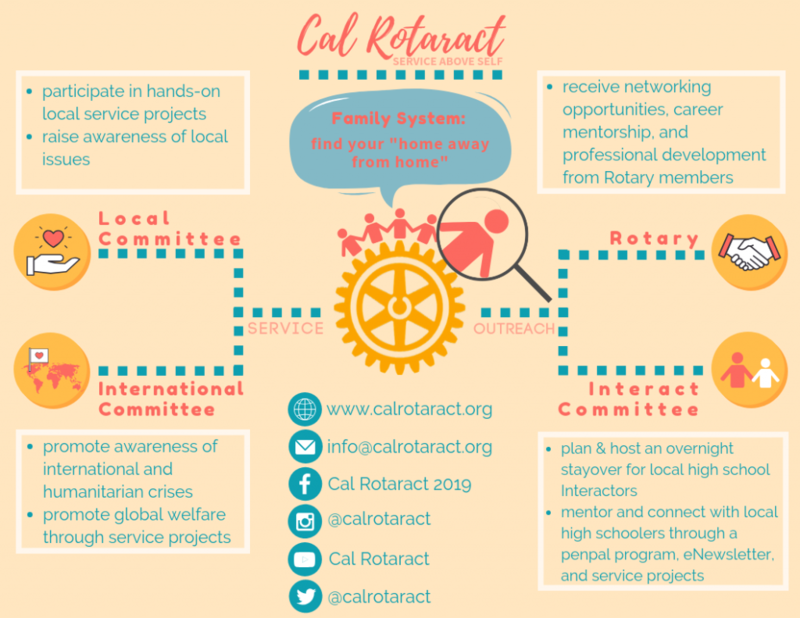 Service: Cal Rotaract offers interesting and exciting projects that make a difference to benefit our local, national, and international communities! Our service projects strive to address some of the world’s most critical issues, such as homelessness and poverty, hunger and access to clean water, the environment and sustainability, and illiteracy and education. Fellowship: Meet new friends who share the common interest of bettering our world at general meetings, service events, amazing socials, and through the family system. Join one of five families of fellow Rotaracts, and prepare to have a fun of semester with the Rotaract officer “parents” and other member “children” through service, social outings, and inter-family competitions! Leadership: Experience what it’s like to plan large service events and service projects with other members on the Local and International committees. Become a professional in the service community by joining Rotary Committee and establishing connections with well-recognized leaders worldwide. Organize a fun-filled weekend for high school Interactors to learn what service is all about the collegiate and beyond levels with the Interact Committee. Are you ready to lead the change you want to see in the world? Rotary: Cal Rotaract’s close ties to Berkeley Rotary allow Rotaract members the unique opportunity to network with humanitarian professionals in the Berkeley area. Through our exclusive Rotarian Mentorship program, members have the opportunity to be matched with a mentor from Berkeley Rotary. In addition, members have access to awards and scholarships through Berkeley Rotary and Rotary International. Service to you, the local and global community, and to life is an incredible daily endeavor. Why embark it alone? Cal Rotaract prides itself in its strong ties with Berkeley Rotary. Being sponsored by Berkeley Rotary, Cal Rotaract is one of the largest Rotaract clubs in the world. Cal Rotaract often collaborates with Berkeley Rotary in putting on some of their largest projects each year, working together as two generations of humanitarian workers and volunteers within Rotary International. Rotarians act not only as individual guides and mentors to service and personal development, but many also attend Rotaract’s General Meetings, service projects, and the end-of-the-semester banquet. Rotarians are often spotlighted as guest speakers for Rotaract’s General Meetings and participate in the Rotary Mentorship Program facilitated by our Rotaract and Rotary liaisons. Berkeley Rotarians meet every week on Wednesdays at 12:30-1:30 PM at Hs. Lordships Restaurant by the Berkeley Marina. If you are interested in attending a Berkeley Rotary meeting, please reach out to a current Rotaract officer who can put you on the list and cover the lunch fee. Want to learn more about Berkeley Rotary and their upcoming events? Check out their website!